So you worked hard to gain your professional expertise and status. You’re great at what you do. And now? To move up, to grow, and to make a bigger impact, your company wants you to be able to sell. You’re not alone. 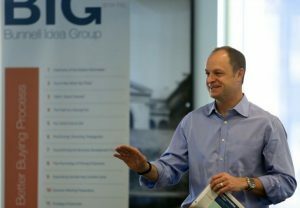 My friend Mo Bunnell has heard this weary cry thousands of times, and built his firm, Bunnell Idea Group (or BIG) to teach busy professionals how to be great at business development. Want to listen on Audible? Choose the book for free when you sign up for a free 30-day trial here. Sign up for Mo’s free Create Demand course here. Darcy: Okay! I am excited to be here today with my friend Mo Bunnell who has a great new book out. 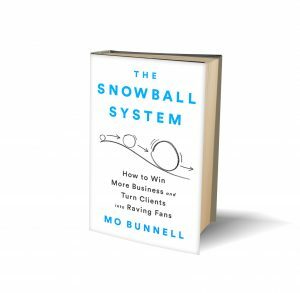 It is called The Snowball System – How To Win More Business and Turn Clients Into Raving Fans. We all want raving fans, right? Join me as we talk about the book, and about what he’s doing – everyone say hello to Mo Bunnell. Mo: Thanks, Darcy. This is going to be fun. I’ve known you for so long and respect what you’re doing, and it’s going to be neat to join forces today. Darcy: I’m excited too. Congratulations on the book! I know that you have been not only doing some of this work back when we used to work together in a large global consulting firm, but on your own and in your own company, and really experimenting with some of these different ideas. So before we talk about the Snowball System, tell me a little bit about you and your journey to get here. Mo: Wow, yeah, I’d be happy to. I think it all relates. There’s a story line here that’s sort of interesting. Mo: It’s so funny. The month after I passed all these actuarial exams to take me from an inch wide to a mile deep, I was asked to move. We had sorted it, we had it orchestrated, but I was asked to move to a broader role where I was sort of an inch deep and a mile wide. I had to represent all of the organization’s services – a couple hundred in total across a dozen or so practices. I went from the past being getting paid for and rewarded for great client service and this deep technical skill I had by passing all of the actuarial exams, and in the future, I was going to be rewarded on client growth. I didn’t have a system for doing that. I asked a boss, “Hey, how do we do this really well?” He’s an awesome guy, I still keep in touch with him, but he sort of said, “You know, you treat the client right!” And I got a slap on the back. I was lucky to have some great mentors, but I felt like I wanted to have a system, something in writing. What started as a few handwritten notes became a small Word document, and then a larger Word document, and it ended up becoming the beginnings of what ended up being the Snowball System. That sort of fear of having used to being rewarded one way, and now having to be focused on business development, growth, and being practically helpful – that fear of making that transition was the genesis to writing the book and creating a system for proactive growth that’s helpful to all involved. But one of the things that you’re talking about in the Snowball System and some of the things that you teach are that even if we are really deep, we’re always going to have to expand that to a new way of selling, or developing. Tell me a little bit about that transition. You mentioned your own transition, but tell me what you’re seeing out there from people who are really good experts in what they do, but now having demands to do more? Mo: Well, you’re an inspiration to so many people because you’ve done it, and so few people have been able to succeed like you have. It comes down to sort of putting two things together – one is, falling in love with a core discipline, a core craft. Something that you can be a really, really deep expert in – that people will want your advice on that core craft, because you’re really great at it. You’ve seen it all, and you have a strong desire to help people within the boundaries of that craft. For you to help people figure out what they want to do with their life and their career, that’s a gift. That’s an expertise that few people have. Then if we can take whatever a person’s core craft is, and not shy away from it but be excited about bolting on the craft of business development – of finding people and talking to them that need that expertise, that’s where the magic really happens. Folks that only have the BD side but no deep expertise can turn into the hollow sales person that’s sort of flinging things at people but not adding a lot of value. Someone with a lot of the expertise, but doesn’t have the ability to find people to hire them for it – that’s a problem, because you end up being stuck in a room somewhere wishing you had people to talk to. It’s putting the two together where the magic happens, and people that have the expertise and the ability to BD, it’s just unstoppable. Darcy: And one of the things you had mentioned before, but when I read the book, it also struck me that this wasn’t just for professionals who have to sell externally. Because, there’s a lot of people that I talk to that they need to… We’ll call it selling – it may not be money transacted, but they have to promote influence internally as well. I know you’re having a lot of conversations with people about that. Mo: Well, without a doubt. This has really been a lot of fun. So we’ve trained these 12,000 experts – if we call them experts, they’re seller experts all over the world – almost all of them are folks that are in externally facing roles. Our training is such that most of the people that have external roles are drawn towards that. What the book has opened up, because it’s inexpensive – it’s less than $20 – is a lot of folks that have internally facing roles, but they’re in the business of influence as well, and they’ve really learned that these same tools and techniques are important for them. Without it, they can become reactive. They can fall into the trap of just being the order taker. Say you’re IT or HR or marketing, you can easily fall into the trap of just taking the orders from your internal customers, but those may not be the most powerful ways you can be helpful to your internal customers. So those same folks that have an internal depth of expertise and HR, marketing, IT, finance, whatever it is, if they can learn these skills of influence if you will – if we broaden the topic from BD business development to influence – they can learn those skills. Now they have a chance to help their organizations in brand new, more proactive, more big ways, and help everyone as they do that. So the people that are using techniques like these, or people who want to build those skills, I think will really benefit from some of these techniques to stand out, to be in service through your profession and not just be the order taker, as you were saying before. Mo: Exactly. It puts you in the role of the adviser. A lot of people use a word like trusted adviser, and becoming a role where you’re helping others very proactively and in a very meaningful way. That just can’t be accomplished if you’re an order taker. If you’re an order taker, the only thing you can be judged on is how quick or how accurate my response is. That’s not where you want to be. I mean, that’s an okay place, but it’s much more powerful to be in a role with one of your internal or external clients where you’re advising them in very, very deep and meaningful ways that are making them more successful, and then that’s creating a pull for a demand for your services. Darcy: Race to the bottom to be fastest and cheapest. Otherwise you’re never going to do it, right? Darcy: So we’ve talked about the system. So let’s dive in a little bit more to some of the core elements of the system. First of all, why Snowball? Things like that. And one of our clients long ago used these six words that I thought were so powerful – Think big. Start small. Scale up. I just love it. That conjured up this image of a snowball, where we want to have this really big impact later on and we want momentum to carry us, almost like we’re unstoppable. But the way you start is by at the top of the hill, building that little snowball and starting it rolling. In the beginning it’s hard, you’re smashing snow together. Snow’s heavy. You might have to get some people to help you. But as you get going, it starts to take on its own momentum, to an extent that sometimes really big initiatives will start to roll on their own. That’s why we thought of that metaphor. It’s hard in the beginning, you have to start with just a few handfuls of snow packing it together. But if you choose your team wisely and the hill you’re on and things like that, then you can start very big initiatives small and get them growing, and then they take off on their own. Darcy: I think it’s such a wise lesson for us to remember. It sounds like common sense, but so many times we get caught up in, we have that bigger vision or we want that bigger project or the dollar signs or whatever, and yet we get so discouraged because it just seems so far away – instead of recognizing that it does have to build, and it does have to grow. In the book, you talk about that there are three things that you’re doing in that snowball phase – you’re managing your opportunities, you’re managing the relationships, and you’re also managing yourself. So tell me a little bit about managing the opportunities to begin with. How do we start to pack that snow together, and even know if this is the hill that I want to roll down? Mo: I love it. And we can even go into a little bit of the science behind why this works as well, that’s in the book. Because we talked a lot about behavioral science of why people say yes to one thing and no to another. But in managing our opportunities, we see a couple key steps that have to happen. The first is, to be really effective at this, you have to write them down. You can’t just manage where you want to take your career or internal or external clients – you can’t manage that in your head. You need to write down what your opportunities are. We take a broad view of opportunities. So if I’m in an external business development role, opportunities aren’t just getting folks to buy my services. They’re also conferences I might want to speak at, or strategic partners I want a relationship with that could provide referrals. So we want to think of opportunities really broadly. Once we’ve got them written down and we’ve thought broadly about them, the key couple steps are to listen and learn to our constituents, to start with them. We talked a lot in the book about giving somebody the “birthday experience.” Making it about them, not us. We have got to start with them. Research by Diana Tamir has found that people, when they’re talking about their own opinions about things and where they want to take them – the pleasure center of their brain starts lighting up. So to give them that birthday experience, we need to start with them. Not a 25 page PowerPoint about us, first. That’s going to get us nowhere. Darcy: That’s such a mistake that people make in presentations, right? It’s like, nobody cares that you’ve been in business for 20 years, or what your thing is. Get them talking, get them moving forward. Mo: Exactly. When we were in business in the 1990s together, the same boring PowerPoints were there, and they were in the same format. Like, “Look, we’ve got missions and values, here’s our client logos.” I know, it’s horrible. So we want to start with them. From our side, we want to listen and learn. Then, we talked a lot and spoke about each step. But then we want to create curiosity about how we can help them solve their problems and move their agenda forward, but we’re going to use their words and their priorities, not our boring PowerPoint first. Then after that, there is a specific way we found – and this is in the book as well – how do you build everything together with your internal and external clients so that they’re really excited? How do we get little incremental yeses using some science called the IKEA effect – largely led by Dan Ariely and Michael Norton out of Duke and Harvard – about how people that have incremental yeses and help shape a project if you will, that they’re going to be super excited about it, rather than us just creating the whole thing and then trying to get a yes over the whole thing? We want little yeses along the way. We talk about the specific four steps to go through that. Then the last pieces, we get approval. What we’ve found is that if people can start with the other, listen and learn, create curiosity on how we can help them solve their problems using their words and their priorities, then build everything together around how we would do that together, everybody else that needs to be involved, then the gaining approval part is pretty easy. It’s when people try to skip from, “I’ve got a PowerPoint, do you want my stuff?” It’s when people do that, that it doesn’t work out so well. Darcy: I think in a lot of these cases, in most of the work that we’re doing today, it’s knowledge work. It’s complex. And even sometimes, we’re selling things that we can’t tell you exactly what’s going to happen from point A and point Z. So getting that involvement, getting that connection, getting all those little micro yeses really helps it not to be your thing, it becomes our thing. Mo: I like it. So well done. I can tell you have a communications background. Darcy: You think so? I’ve worked with a sales person a time or two. Darcy: I remember this – you said you and I have known each other for many years, got a chance to work together, but one of the things when you went out on your own, we had had lunch and I was still working at our large consulting firm and I really had never envisioned for myself having my own business, nor do I think it’s something everybody should do or can do. But one of the things that you did say – I said, “How are you getting opportunities? How are things coming along?” and you said, “I’m giving things away! I’m giving people things they need. I’m serving them first.” And there’s a trust aspect there, not only of trusting your potential client, but trusting yourself. I wonder if we could talk about that when we talk about relationships – sometimes, we have to give a little bit more than I think today in our corporate environments were being encouraged to give, but that’s not a necessarily concise and clear question – but, talk about the giving to get? Mo: It’s so important. I’ll specifically put it in the context of relationships, like you said. Managing relationships being a big important part of the Snowball System. The context first – relationships are so important to manage proactively, because all of the science shows we’ll be whipped into spending time with people that we’ve come into contact with already. The same parents on our kids soccer teams, the person we just happen to have an office next to at work. Things like that are going to be the number one correlation between who we spend time with. So we’ve got to have a system to steer our time to folks that we need to spend time with. Those that are our bosses, the decision makers, partners that can provide referrals, third party influencers. Folks like that. If we don’t focus on relationships, we’ll just be whipped into the people we come in contact with because the world says so. But we’re talking about like what you said before, we’re giving away our big brain, giving away our expertise. Finding strategic ways, 30 minutes or 1 hour blocks of time – how can I figure out where that person is trying to go with their life and their career, and finding ways with my expertise, I can give them a taste of the experience of what it’s like working with me and, one hundred percent focus on them, one hundred percent help them. What we find then is that two things happen – one is, we deepen the relationship because we’ve given first, and two is, now that they’ve been exposed to what we do, there’s a higher likelihood that they want more of it and would purchase it, or they would advise others to purchase it. As opposed to talking about what we do, we’re going to do what we do. Give it away in little chunks, and then all those good things happen downstream. 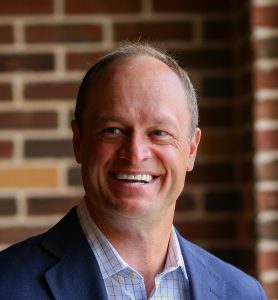 Darcy: Today, even as fast paced and competitive, and all those different cliche words that you’ve put together with business, that piece of generosity, that piece of saying, “I’m here to serve whoever shows up and however shows up.” But the piece in your system that is really useful and interesting is also intentionality.
. . . I think we just saw your wife go by there. Mo: (laughing) You know that YouTube video where you’re supposed to count the basketballs and a monkey walks past and no one sees it? (to his wife, offscreen) I promise I wasn’t calling you a monkey! Darcy: Exactly. We’ll have a test if we can identify what she was wearing. So talk a little bit about – there’s a lot of tools that people could have to think about building relationships, but the idea of spontaneity is an interesting one. Talk about that a little bit. But to your point around spontaneity being so important, the Tabasco of relationships – now is a great time to reach out with Jane! In fact, the best time of the next 5 years to reach out is right now. No matter what the situation is. Because if you don’t do it now, another day could go by, another week, another decade. The idea of spontaneity is so powerful because the fact that Jane isn’t expecting the outreach actually makes it sort of better. It’s sort of magical. Just sending a little note like that if it’s truly authentic, if you really feel that way, then there’s nothing wrong with that. Then that starts the dialogue. Jane is going to respond, and now you have an opportunity to find some other way to be helpful, other than just brightening her day. I just love the idea, if you’re worried about reaching out to somebody, right now is a wonderful time to do it. There’s no better time than now. We could talk about the ideas in the book and talk about different stories, and I’m sure for a long time, but I think for the sake of both our schedules and our listeners and viewers, you in addition to having a great book, there are some other resources that are connected to the Snowball System. Tell me more about those, and how people can get a hold of those. Mo: Oh yeah, two big ones. One is to get the book and all the resources surrounding it, maybe just go to SnowballSystem.com – super easy. Then when someone buys the book, there are some URLs written in the copy of the book that will take them to some specific pages where there are no navigation to it, so you have to buy the book to get them. But they can download over 20 different worksheets that help them implement every single aspect of the book. I think of it more than a book, because there’s all these worksheets and tools and videos that I give that helps people walk through it. So I think of it as a total system for how you can expand your influence in a really positive way to make a difference in the world. Of course, the title and the subtitles are all about business development, but really it’s about more broadly speaking, influencing the world in a bigger and positive way. The second thing I bring up, is that we’ve got a free video series that people can get if they go to CreateDemandCourse.com. When they first sign up, the videos are delivered by email. There’s an 8 part series on create demand, that’s why we named it CreateDemandCourse.com – what a great idea! That 8 part series walks through some of the things we’ve talked through today, but in a lot more detail. In those 3-5 minute videos, those first 8 are dropped right in your inbox, and then they come with some worksheets too. Even if somebody didn’t have the 20 dollars to buy the book, they could get the free worksheets and get a lot of value out of that too. The two together? Really powerful. I really like the intentionality of some of those tools – especially for those of us who, maybe sometimes we try to do it on the fly, but then life gets in the way – so to have a road map. That’s what you’ve given in a lot of the different tools, and I’ve been diving into them myself, so thank you for those. Mo: Exactly! I’ll tell you, we put so much time into that. When we got the major book deal, one of the things I wanted to do right out of the gate was not to just write a book, but give people the whole system. So then when they’re reading the book, they’ve got the worksheets right under there – close the book, pause that, come over here and fill out a legion tool or a “How do I communicate better” tool, as an example you gave. Or maybe it’s their list of opportunities or relationships and specific steps and what to do precisely next to keep those moving forward proactively. Whatever the tool is, when people are going through the book, they’ve got those resources right there to help them implement. That’s one of the things I really want to do with the book – not just give people ideas, though I think that’s great, but to give them ideas they can implement. That’s where the difference happens. Darcy: I think the book is terrific and it has a lot of great resources. I’ve always learned from you, and you’ve been a person to help me build my skills in being able to influence and share my story with others, and do it in a hopefully generous and authentic way. So, I thank you for that, and thank you for taking the time and energy to be here with us today, as well as for all the work you’ve put into the book. Mo Bunnell, where can people find more about you? Mo: They can just go to MoBunnell.com. Darcy: We will have links to that. MoBunnell.com. Mo: And SnowballSystem.com takes you to the same place, that’s probably how I should have answered it. You can only spell that one way! I’m not sure I ever did, but I knew I needed help at it. Your ability to communicate with others, to put things in writing, to verbally communicate – your expertise around communication and now these days, helping people find their way – it’s really powerful. It’s been so fun for me to root on from the side lines and watch you grow your career and establish even more preeminence in this field, it’s just been fun to watch. So thanks for having me. Darcy: Thank you and thanks for the kind words. We’ll just keep doing our good stuff and supporting each other and supporting everybody out there watching us. So again, the book is The Snowball System. Go pick it up, and wherever you’re seeing this video, you’ll also have other links so that you can find out more about Mo and the other work he is doing, including some public workshops. If you want to get really down deep and dirty in developing this, even more so than the book, I really encourage you to check it all out. So, Mo Bunnell and Becky Bunnell in the background! Thank you guys for being here today, I appreciate it. Mo: Thanks Darcy, I appreciate it. It’s been a lot of fun.